The shooting death of Michael Brown in Ferguson and the choking death of Eric Garner in Staten Island have dominated the news cycle for weeks, making it almost impossible to get any other issue onto the agenda. Immigration, Ebola and ISIS have all been reduced to the status of warm-up acts. The death of Eric Garner has riveted the nation because we have the video. A few voices on the hard right are defending Daniel Pantaleo’s use of the choke hold, arguing that it was somehow Mr. Garner’s fault for being obese and having high blood pressure. But most commentators, regardless of ideological persuasion, are baffled by the grand jury’s decision. Even when the footage is grainy, the camera doesn’t lie. The Michael Brown story has captured the lion’s share of media attention precisely because we don’t have the video. We know that Michael Brown stole cigarillos from a convenience story, but we don’t know if officer Darren Wilson was aware of that fact when he initiated his confrontation with Brown and his friend Dorian Johnson. Most significantly, we don’t know if Michael Brown was surrendering with his hands in the air when he was shot, or if he was in the process of “charging” officer Wilson with demonic fury. Saint Louis Rams players created a sensation when they performed a “hands-up-don’t-shoot” pantomime on national television. White viewers, Mike Ditka notably among them, couldn’t understand why these black athletes were clinging to a narrative that had been thoroughly debunked. But has “hands-up-don’t-shoot” been laid to rest, or is it merely one side of an unresolved he-said-she-said between Dorian Johnson and Darren Wilson? Why do most white Americans take Darren’s side of the story while the vast majority of black Americans side with Dorian? The most obvious answer is that white Americans have little personal experience with abusive policing and therefore have a hard time identifying with the friends and family of Michael Brown. But it goes deeper than that. White America is mystified by the looting and arson that came in the wake of the non-indictment of Darren Wilson. Everyone knew it was coming. But why? Why would anyone want to destroy their own community like that? Black America denounced the violence and looting as well; but found it perfectly comprehensible, even inevitable. The messy narrative in Ferguson has sparked a productive conversation about the militarization of American policing, the advantages of body cameras and the need for community policing strategies. It hasn’t all been a waste of time. But the gulf in perception dividing white and black America is once again front-and-center and that gulf demands an explanation. This question is particularly salient in light of election results driven by white disaffection with America’s first black president. Non-whites are mystified. The stock market is exploding, the unemployment rate is dropping, gas prices are in free fall, far fewer American soldiers are coming home in body bags, the Benghazi “scandal” has been laid to rest, the increase in health care costs is (finally) slowing, and the crime rate has been dropping for decades. Yet America’s white voters are in revolt. Why? White America is in full panic mode, a fact that is reshaping American politics, religion and news media. This myth of Righteous America is under assault. Popular entertainments like Ken Burn’s documentary “The West” or movies like “Twelve Years a Slave” call this mythology into question. Confidence in American institutions, like Congress and “the clergy”, is at a all-time low and falling fast. And now we are told that global warming is a product of the unfettered economic dynamism that we have hailed as America’s gift to the world. White people believe Darren Wilson’s version of events because, in their view, law enforcement exists to protect us from criminals, that is, those who refuse to work, those who refuse to take responsibility for their actions, those who refuse to better themselves. Which is why the moral failings of Michael Brown and his parents figure so prominently in white American discourse about Ferguson. The panic evident in white America is driven by the very fragility of American mythology. In our hearts, we know American history is riddled with moral ambiguity (to put it as gently as possible). The military adventurism of recent years has been an unmitigated disaster, and we know it. The greed and corruption of international corporations and Wall Street speculators may be deemed a necessary evil; but it is evil all the same. The science behind global warming is unassailable. Deep down, white folks know that too. The self-serving flatulence of preachers and politicians is disheartening. Most significantly, we are beginning to realize Jesus, the religious icon of America, had very little to say out hard work, personal responsibility and self-reliance. Jesus was about unconditional love, universal forgiveness and the demolition of us-them categories. It’s all there in the Gospels in black and white. The Jesus brand has name recognition going for it, but nobody takes the man from Nazareth seriously. We trust him as a guide to the world to come; but in this world we trust hard work, personal responsibility and self-reliance. If their sermons are anything to go by, even our preachers prefer the Myth of Righteous America to the moral vision of Jesus. Step out of white America and, instantly and utterly, the moral panic dissipates Non-white Americans love America dearly, but this love rarely shades into idolatry. We are comfortable with real American history, moral ambiguity and all. Non-white America believes in hard work, personal responsibility and self-reliance too; but we have seen how social systems and institutions often conspire against these values, sowing despair and desperation in the hearts of confused young people like Michael Brown. Tragically, the moral vision of Jesus is rarely heard in black and Latino pulpits. For the most part, Christians in minority communities inherited their theology from white people. Conservative black preachers lament the injustice of Ferguson and Latino Pentecostals cry out for immigration reform, but they have a hard time relating the Bible to the cry of their hearts. Only Jesus can bridge the racial divide; but who will speak for Jesus? Good thinking – as always – Alan. I still can’t comprehend it either …. “it’s” there, staring us in the face. The proverbial “pink elephant” in the room!!! A sequence of events initiated, by Michael Brown, led to his death. 1. He is on video robbing a store and shoving the owner aside, under the law, a felony. 2. Officer Wilson, in that area on another matter, recceived a report of the robbery and description of the offender on his car radio. 3. Michael Brown and his buddy elected to walk down the middle of the street instead of pedestrian space. 4. Wilson drove beside them and told them to move from the middle of the street. 5. Instead of obeying a lawful order of an officer, hostile words were exchanged. 6. Brown reached into the police vehicle for the officer’s gun, which was fired, wounding Browns hand. 7. Brown’s blood was found inside the car. 8. Instead of surrendering as ordered, Brown started to flee on foot, then turned and charged back toward Wilson, who shot him several more times. 9. Autopsy by Missouri medical examiner, and another by a the famous Michael Braden, confirmed that Brown was not shot in the back. Officer Darren Wilson, who had never shot anyone, was doing his job, trying to apprehand an offender who had committed a crime. Brown’s actions led to his death. Why is he not responsible for his actions? Why is the officer, whose function is to protect the public from crime, made to be the villain? Why is there no sympathy for business owners whose property was consequently destroyed by riioters, fire and thieves? What happened to personal responsibility? Gene Elliot provides us with an example of a white person (like myself), who, unlike me, defends Darren Wilson. Now, after the Grand Jury found no reason to indict him for the unarmed Michael Brown’s death, and St. Louis County prosecutor Robert McCulloch even released some of the testimony from the proceedings, which were held in order to defend Darren Wilson, not for the usual reason of finding out whether there was sufficient evidence to try him, many people are publicly using “facts” from testimony there to defend him. Just because Michael Brown was not shot in the back, does not mean it was a “clean” shooting. There was no blood trail from Brown back toward the car. There was no gunshot residue on Brown’s wounded hand where he was “shot trying to take the gun”, which is not possible with a fresh gunshot wound. 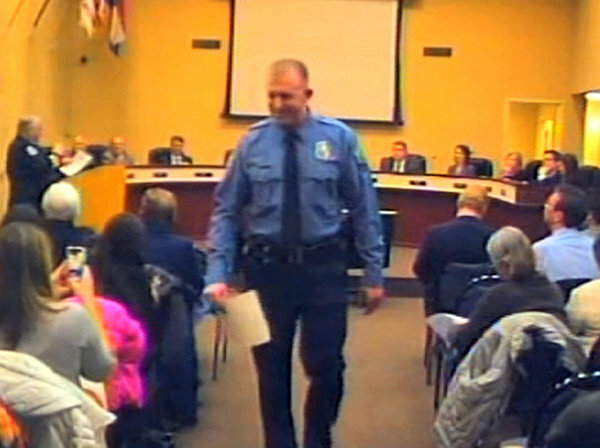 There was no “touch DNA” from Michael Brown found on Darren Wilson’s weapon. Darren Wilson was able to give a statement to the Grand Jury which conflicted in some points with what he had stated previously. This one he had time to prepare, but it didn’t necessarily make it hang together. There are reasons that defendants don’t testify in Grand Juries–First, they can be cross-examined by the prosecutor; perhaps because he wanted to defend, not prosecute Wilson, McCulloch didn’t do so–Secondly, that sworn statement can be used against him in court. Perhaps he doesn’t foresee his ever facing that eventuality, at least in Missouri. Gene, I may be misguided in trying to persuade you that this case is still one with many unanswered questions, but my attempts are in the cause of getting you to admit that the answers are not easy ones, and to read the article again. What if we do have a problem with oversight of police officers–especially for the community of all people of color–those who believe in personal responsibility are afraid of police officers, too! « Is Jesus irrelevant to the immigration debate?